I like to pop into my local Anthropologie every season, usually for their amazing furniture knobs, but always for the eclectic styling of the store’s display artists. Apparently, every Anthropologie store has its own Installation Artist that is given a theme from headquarters, but is allowed their own carte blanche interpretation ~ or so the sales clerk told me. I have no idea if this is true, but if it is, it sounds like a dream job. I can only imagine how fun it must be to push the artistic envelope and challenge yourself to ‘style’ outside the box with merchandise as fun as that found at Anthropologie. Strings of multiples make a huge impact on display, whether it’s falling leaves in the main clothing display room. . .
. . . or paint dipped clothespins in the dressing area. 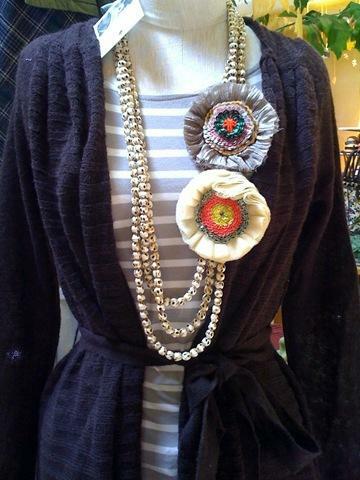 Embellish a set of basic beads with a fabric flower and you have instant modern style. This is a favorite. 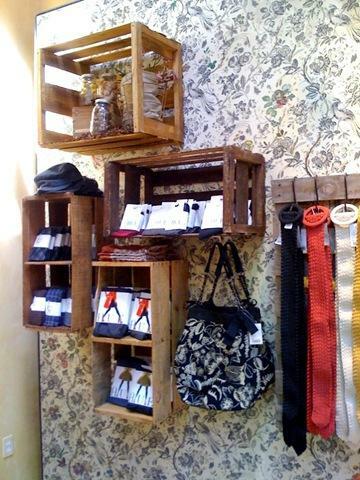 I love the pairing of the elegant wallpaper with the rustic wood crates and pallet. Speaking of pallets, here’s another example of brackets and shelves attached to this shipping supplier’s tool turned textural design element. 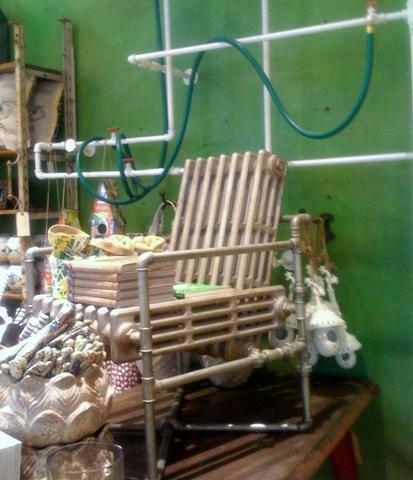 This was a quirky display over the summer ~ a chair fashioned out of an old radiator and galvanized pipes. I’ve adored this Atelier Chesterfield in a buttery yellow leather for quite some time, swoon ! A rich yellow like this works just like a neutral ~ everything looks great with it. They move it around my local store and restyle it every season, and I can’t take my eyes (or fingers) off of it. Over the summer, there were a lot of painter’s tarps dripping with plaster, covering light fixtures, forming tablecloths, and even ‘wedding’ gowns in the window display. 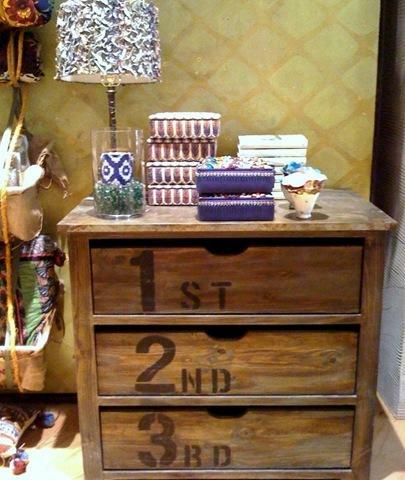 A basic wood chest gets more interesting just by numbering the drawers. Here is something new ~ the High Minded chandelier which has an iron base with the arms decoupaged with encyclopedia pages. Hmmm, interesting. I could see this fixture hung low over a reading nook, or as a whimsical addition to a library space. I thought this would make a great knockoff DIY project, especially when I saw the $998 price tag *choke* plus $150 shipping. Ouch. 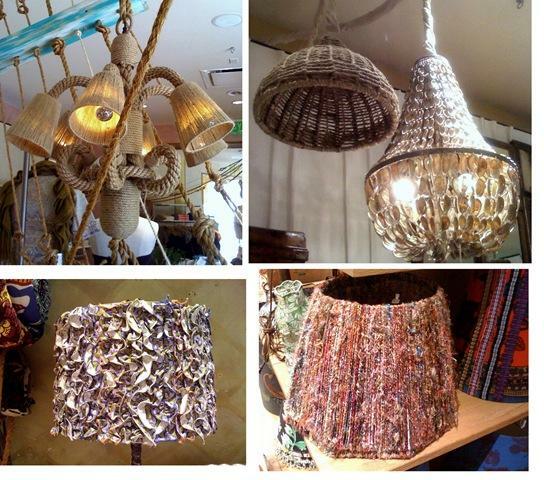 One thing is for sure, their light fixtures are never dull ~ you’ll find them covered in jute or made out of baskets and shells. The lampshades are all creatively embellished too, with ruffles, yarn, and patchwork appliqués. Anthro always has the best books on display with titles that tempt me so. 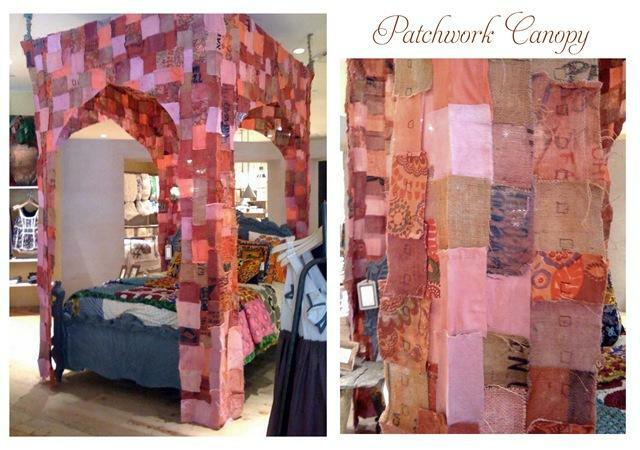 Here’s the latest eclectic addition to my local store: a pink patchwork canopy made out of burlap and fabric scraps. Not that I’d ever think to place something like this in my own home, but the bohemian global feel conveyed by the entire bed was worth ogling. An aluminum funnel makes a great rustic garden cachepot, but do you think it makes a good light fixture, especially when paired with galvanized pipe and doilies to form a headboard ? Not so sure about this one! But that’s what I love about stepping into this store. Visiting a well styled Anthropologie is like visiting a mini modern museum of art. You never know what you’re going to see, but it is always interesting, always inspiring, and always challenging us to decorate outside the box. Is Anthropologie a favorite stop of yours too ? If only they had a store here in Australia – it looks absolutely fantastic. wow dont think they have them in the uk but they look fab! Yes, they’ve recently come to the UK! Hooray! I do so love Anthropologie. Absolutely scrumptious! I’ve just starting Following your lovely blog. I am a bit confused as it says I’m the first Follower??? Surely that can’t be right…..
Love the store! So much eye candy!! Absolute favorite stop! There’s always so much inspiration to be seen. It’s funny, I do the same thing when I visit- always bring my camera and snap lots of pics! Thanks for sharing. At least I know I’m not the only crazy lady taking numerous pictures every time I walk into the store. I was in one in California this summer and I was drooling over the displays. I snapped a few pictures myself for inspiration. I have a thing with lamps and lampshades and I always find the best ones there, and on clearance to boot. I’m making that my tradition. Every time I travel to see my sister, I come home with a lampshade! I love Anthropologie. The creativity there always amazes me. It’s always one of my favorite and most fun shopping stops. I will look with a new eye next time I visit Anthropologie. What wonderful vignettes you’ve pointed out for us, thx! In my past life (a decade ago) I was a visual merchandiser and I interviewed for Anthropologie. Unlike many shops which provide a floor plan from HQ, Anthropologie (at least at that time) encouraged the VMs for each store to get creative. You were told what needed to be on focus, but that was about it. Sounds as though you have a very talented VM crew at your local Anthropologie! I often wish I took the job at Anthropologie instead of being swayed to stay at my company with the counteroffer. What a great environment to be in and create every work day! LOVE Anthropolgie it’s one of my favorite stores I just go in and soak in the inspiration. My all time favorite skirt and top are from there — I need to update but can’t afford to right now! 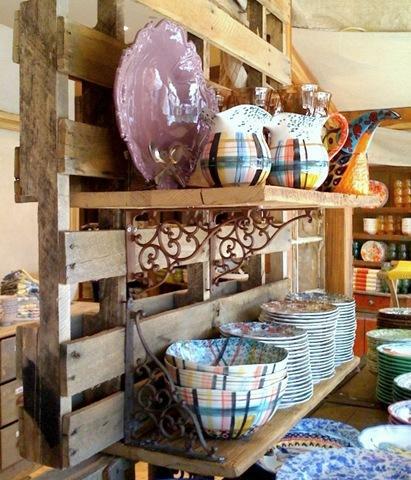 I think that’s the point of anthropologie….their stuff is soooo expensive, but ogling is free! It’s the best place for inspiration and ideas, too. I remember seeing (in Dallas, I think) a Christmas tree made out of vintage books. It was a thing of beauty. Of course! Going there is like taking a mini vacation! OMG!! I LOVE Anthropologie and wish we had it here in Australia!! Infact I love it so much I have just got a friend in the US to buy me a quilt and send it over. Devine!! And I love your blog, so inspiring, definately visiting more often! So fun! Your great finds always inspire me! I have to say that I especially love a store that has so many things that make me drool, but also some that I could just never see using, it’s that perfect balance that forces you to push the envelope a bit! Love anthro! they always have something gorgeous that I covet! Sadly, I have no Anthropologie store near my home. I got my catalog in the mail yesterday, though. So I will settle for that. Thanks for the glimpse inside an actual store. It is definitely a favorite store of mine. It is the one place I can go and even buying nothing, I leave fulfilled. I could get lost in there just admiring their displays. Love Anthropologie! My second comment today about Anthropoligie, WHY have I not heard of them until today! I was on the Maine Maven site, she referenced them so clicked to check it out. I found two things I must have, curtains and a chandelier (may have to do a knock off of the chandelier). Great stuff! I haven’t been in a long time, but this makes me want to go. I agree there is always so much inspiration to be found there! Great post! I was just in Anthropologie over the weekend picking up knobs for a chest that I am painting. They always have such wonderful hardware and other items to chose from. I got four of those alphabet hooks and spelled “H A T S” for my husbands many golf hats. I’ve picked up quite a few gifts there too. A lot of their items are expensive but they do have some that are unique and not too high. I just got a set of recipe ‘post it’ tags that will be a gift for my friend who loves her cook books, and I’ve bought a lot of those initial mugs in the past. Now I want to go back and just bask in the visuals instead of concentrating on shopping! I adore Anthropologie, such a neat store. I am loving the falling leaves in the store, such a great idea for fall. I wish there was a store close to my town, I would go there all the time for inspiration. Thanks for sharing! Great store. There is a show on the Sundance channel about one of their buyers who travels the world finding new unique elements for the stores. He finds things for both mass production and one-of-a-kinds for store displays. Man Shops Globe. Check it out. I LOVE ANTHRO!!! I actually applied to work there recently but didn’t get hired. They do have their own visual team for each store. I think that would be the most fun job ever! My sister recently got hired at the one in Palo Alto…. I’ve never actually been into Anthropologie, I’ve seen a catalog a few times but it obviously doesn’t do it justice — what creative styling! If only I hadn’t moved 3 1/2 hours from the closest one 2 years ago… ask me if I’ve been to a farm supply store recently. Sigh. Yes! It is def. a favorite stop. Especially a great “getaway” during lunch time. I’m going to have to try my hand at the doily headboard. We recently acquired an Anthropologie a few years back, along with a Z Gallerie (which equals happiness). I love their displays and decor, it’s half the reason I make a visit. I hope it’s true about their Installation Artists. I love Anthropology they have fun stuff in there! They are pretty amazing! Everytime I’m in a new city I have to visit their Anthro store. I also love the candles they burn. It’s so warm & inviting. Do you think anyone would notice if I just curled up into one of their armchairs & read a good book? It is , it is my favorite store. I am always doing blog posts about shopping there, not quite as wonderful as yours…I am still shy about taking pics in stores, getting better though. I just did one recently and was actually pretty brazen about it. I shall have to be more so when they deck the halls so to say! LOVED this post! Anthro is one of my favorite stores…great styling, always smells amazing, I’d like to move in! I’ve taken home so much inspiration from those stores. I love that they don’t only decorate with the items they sell, but they decorate their stores to match the seasons or what have you – just for the heck of it! I LOVE ANTHRO!! Their clothes are so gorgeous…wish they were a little cheaper! Their housewares are so amazing and unique too…still haven’t gone and checked out their knobs in the store yet…just online. Need to get some! You know I love to go in to the store whenever I get to a mall that has one. I rarely buy anything…a candle here and there, soaps…but, I wander around like a kid in a candy store just touching things. Ah ha! Hearing that each store has a different stylist TOTALLY explains things. There are two Anthros near me, and while I never go to them back-to-back, I have been to them within a couple weeks of each other. I was starting to wonder if they just changed their displays all the time, but this makes sense! It really is an incredible store – as you say, you never know what you’ll find. If they’d only open a cafe, they could definitely charge museum admission! Oh my heavens, I never knew such a place existed! Have I been living under a rock?! I guess so. 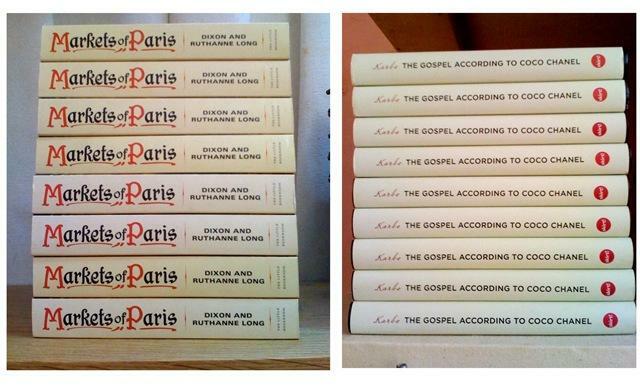 Now I need to find the closest Anthropologie and take a look around. It looks super amazing! Wow, your Anthro is amazing! Ours is not anything near creative. I was actually quite disappointed the first time I went to ours because I had heard it was such a cool place. I love Antho’s styling. Not everything I would want in my home – but I do love some of their creative ideas and the way things are pulled together! Great pics! Most of the design choices at Anthro are a bit “out there” for me, but they are definitely fun to look at! 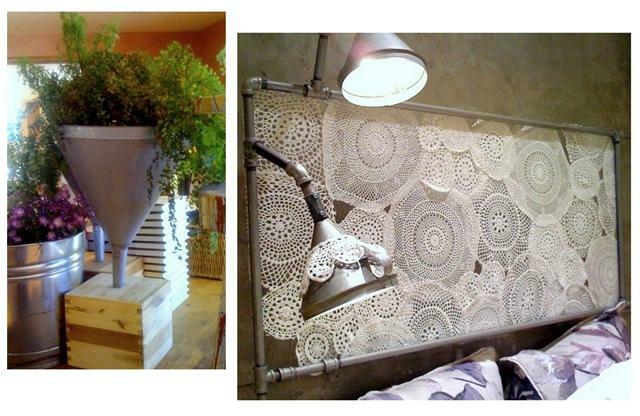 I think I really like the industrial/doily headboard, though! How could you not love this store? It is amazing. I find inspiration from all over the place the second I step foot in it. Oh how I wish there was one near me. I have enjoyed your version as much as being there in person. Maybe on a cold winters day I will decide I need a road trip. Anthropologie sounds like a wonderful destination. I adore Anthropologie! I just wish it was more within my budget. However, there’s nothing like the thrill of a good find in their sale room! Love visiting Anthro. It’s like a spa day, just slowly walking around the home section. I have to restrain from going there too often! An Anthropologie just opened around here and now I totally understand what all the fuss is about. I actually work at the Anthropologie store in Westport, CT and what the sales clerk told you is truth! It is quite an amazing store to work at, and I’m working on some day moving into that position. It’s fun because every store is different. And it’s not just another job! Love the dangling Autumn leaves! I’m wondering if my husband would go for this in the living room?!?!? 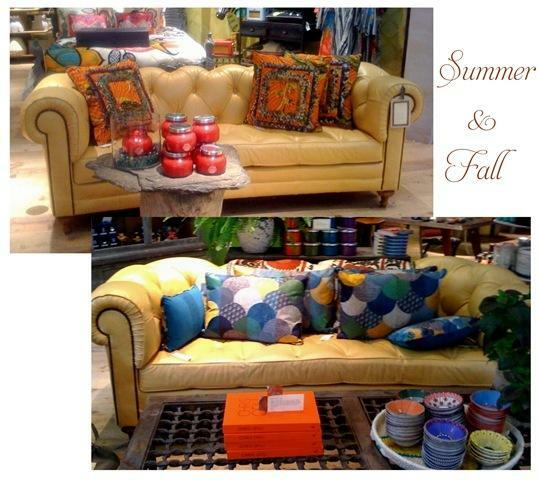 And now, I, too, am swooning over the buttery sofa….to die for! No Anthropologie store anywhere near me here in Central Texas, so thanks for the tour! I adore Anthropologie. I usually go for the fun knobs as well but love to roam around and look at everything. Lots of great inspiration! They do have good sales, too. How clever is that painter’s tarp wedding gown! Brilliant Cassandra ! Thanks so much for verifying. LOVE that you work there, what fun that must be! I’m envious of your position! Yes, I adore Anthropologie and have done a couple of posts on their styling too. I get so inspired there, they really help me think outside the box!!! I always find Anthropologie to be inspiring, but want the same look for less. I found your blog somewhere on the bunny trails today; you have lots of great information! I love walking around in Anthropologie as well. They have some greally inspiring ideas. I agree that it’s not all right for my home and it’s waaay to rich for my blood, but it is fun to look around. I am total agreement with you. That store is just one big ol’ HUNK of design inspiration! That would totally be a DREAM job! I’d love to know what they do with their “props” when they are done. Over the summer, ours had a totally FABULOUS bed made from a vintage wooden rowboat. I was in LOVE with it! Butter yellow leather is one of my faves too! As I couldn’t afford the leather, I instead bought it in a suede couch made to order by Sears. Many $$$ dollar signs cheaper, but a real beauty none-the-less. I have pages of the Anthro. cut and saved for future project thoughts in sewing and jewelry etc. They sure can put the odd numbers, beside the even can’t they? A rather exciting blog – gets the creative juices boiling. 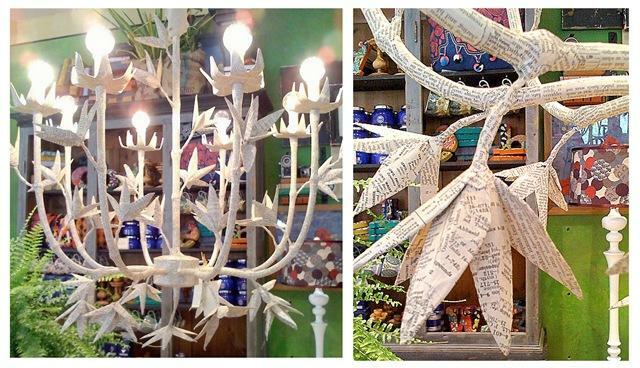 I would love the job of installation artist at Anthropologie! I think if I worked there it wouldn’t even feel like I had I job… and I probably wouldn’t have much of a paycheck left either! I love Anthropologie. I love their unique clothing & accessories, their homegoods, and the stores. I love how every store has its own personality. I love everything about Anthro…except the pricetags (but they have good sales). 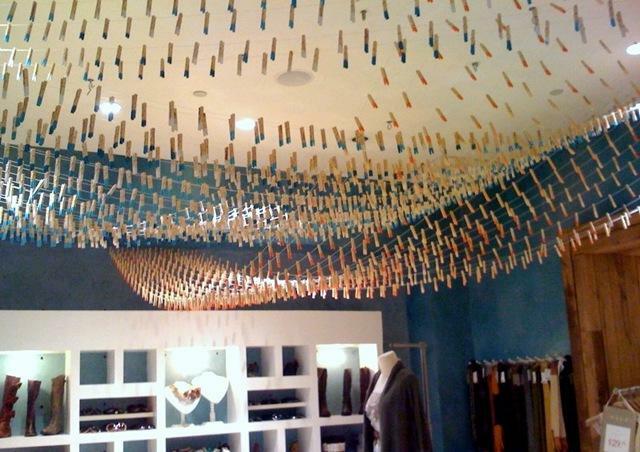 That clothespins display is just amazing. I have asked the Anthro by me who does their displays because they are always so inventive and fascinating to look at. The first time I stepped foot in Anthropologie was 11 yrs ago in Long Island NY. I was a nanny fresh from HS in Nc. I felt I had died and gone to Heaven. I then went weekly to hit the sales and just get inspired. Your photography was so fun to look at.I call Anthropologie my happy place. Great post. I never mind a post about my favorite store. :) Thanks!! !